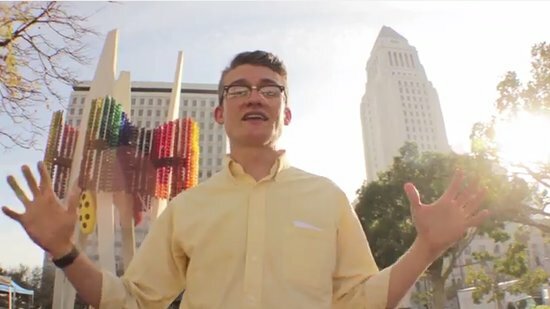 Tom Explores Los Angeles is the greatest thing you will watch about Los Angeles today. Earnest, genuine, thoughtful, passionate, and informed, Tom Carroll tells the stories of Los Angeles one landmark at a time, guiding us through the evolution of our city and the distinct features and background that makes it truly unique. If you’re a combo history buff and an L.A. aficionado (raises hand), then this is the show for you. Looking a bit like a Weight Watchers version of Drew Carey, with a retro hipster look and a narrative style that is reminiscent of a subdued Huell Howser, Tom is like a good friend dropping fun knowledge as he walks you through some of the most interesting parts of L.A.
Of course this is all to say that Tom Explorers Los Angeles has quickly become my new favorite show about L.A. online. What began as a school project collaboration between Tom and director/friend Derrick Deblasis has evolved into a YouTube show with 17 episodes (and counting!). Episodes range from three to ten minutes in length, but the time seems to fly on each one, and you’ll easily be able to power through them all if you get hooked (raises hand). Honestly, I’m amazed I didn’t find this sooner, but I hope to see more (many!) episodes uploaded soon. Check out some of our favorite episodes below, with a link that follows to subscribe to the channel. Enjoy! Tom Explores Edlred Street, the steepest street in California (yes, more than any in San Francisco) and third steepest in the entire United States. Who knew it was in our own backyard!?! Tom explores the old Los Angeles zoo in Griffith Park, and discusses how the original zoo was built and operated on a shoestring budget, and how the current remains of the old grounds are a window back in time to the L.A. of yesteryear. Tom explores the sunken city in San Pedro, where what was once an exclusive community of California bungalows literally just fell into the ocean. Tom explores the L.A. River and it’s important place in the cities history. Did you know there is an abandoned Nazi compound near Beverly Hills? Tom does. And he explored it (obviously). If you’d like to see more, we highly recommend visiting Tom’s YouTube page to subscribe.